Generally good attendance has been the norm for the past couple of weeks. The only exceptions would be Houston last week (12047) and San Jose (8122). Never mind the unyielding heat east of the Rockies. People are coming out to the games. I thought I would look at another interesting piece of data. I do a lot with "relative attendance" (actual/capacity) in addition to mean and median. The relative attendance is usually for the mean. But what about the median relative attendance? This week I look at the Eastern Conference. 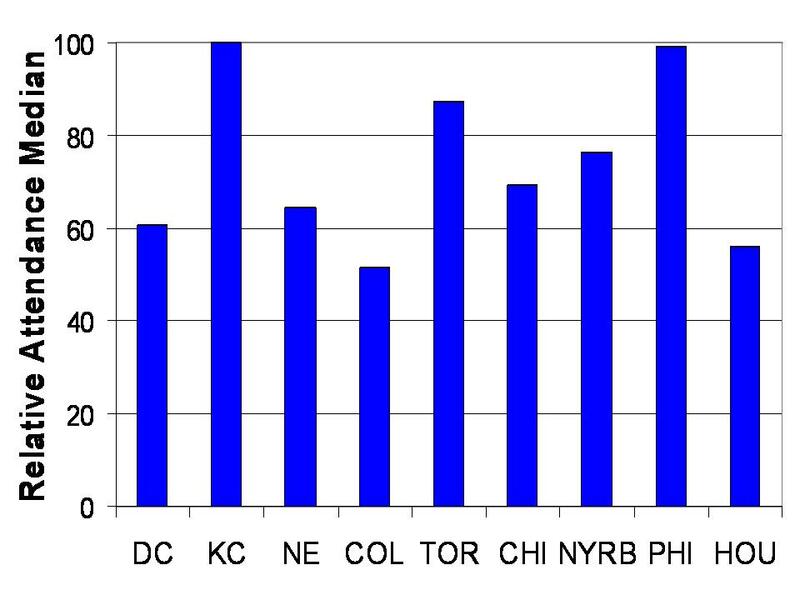 We see that, on any given week, DCU is at 61% capacity as well as New England (65%). Lowest here are Houston (56%) and Columbus (52%). Do note, however, that Houston's capacity far exceeds most of the Eastern Conference (27000). KC (100%), TFC (87%) and Philadelphia (99%) are the highest.